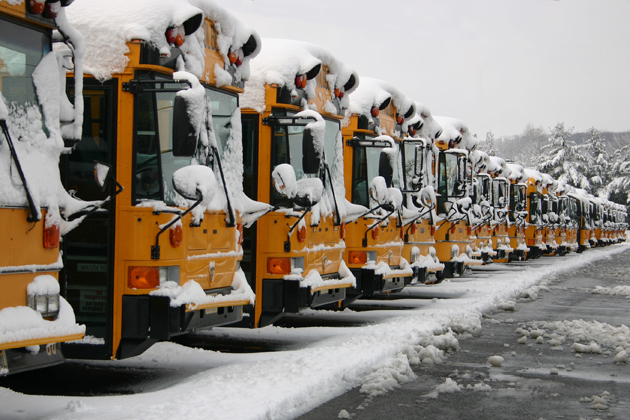 Imagine, if you will, that you serve as Director of Schools in an unnamed middle Tennessee county where winters are–in recent times, at least–relatively mild. So mild that county leaders have wisely chosen not to waste money on large numbers of snow plows and salt trucks. So mild that most people don’t need four-wheel-drive vehicles. So mild that few children keep long johns stashed in their underwear drawer. This unnamed county is one of vastly varied topography. The heavily travelled streets of the county seat usually clear quickly on the rare occasion when an inch or two of snow falls. But the rural outskirts of the county are another matter entirely. Steep, narrow roads—several have the word “Ridge” in their name—wind through tree-shrouded terrain and rarely receive enough direct sunlight to melt snow. The snow that does melt often refreezes during the night, creating invisible but treacherous black ice. A discouraging number of children who hail from these parts live in homes with inadequate heat. Breakfast and lunch served at school is, for some, the only quality nourishment they receive. Too many of these children don’t own a coat or hat or mittens, let alone long johns. When extreme weather threatens, it is your job to decide whether to open or close early or to cancel school entirely. This is a responsibility you take very seriously. You constantly monitor the forecast. You consult with your bus supervisor and with school principals. You travel to the most problematic areas of the county to check on road conditions for yourself. All the while, you weigh the loss of precious instructional time that comes with closing school with the worry of having children out and about in frigid temperatures on potentially unsafe roads. You worry about the children who struggle at home when school is called off. And then you make a decision. Or “When I was a kid, they never closed school because of snow.” This statement is often accompanied by the insistence that–back in the good old days–kids walked to school barefoot, uphill both ways. As Director of Schools, you understand that dealing with these kinds of remarks is just part of your job, so you don’t take the criticism to heart. You know you were hired to do what’s best for the students, not what suits parents or teachers or taxpayers or anyone else. Every day, whatever the weather, you do the very best you can to take care of the children who go to school in your county. But you can’t help but think that it would be nice if, every now and then, those who are so quick to second guess you could walk a mile in your shoes. Barefoot and uphill both ways.